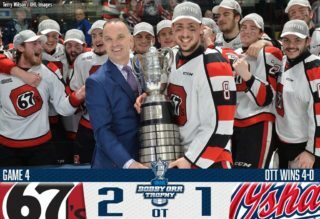 The weekend of June 23-24, 2017 is one that Morgan Frost (Soo Greyhounds), Isaac Ratcliffe (Guelph Storm) and Matthew Strome (Hamilton Bulldogs) won’t soon forget.. 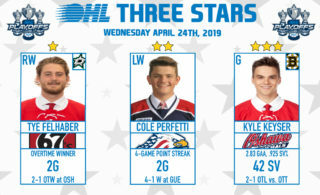 The three OHL forwards had a Windy City whirlwind of a weekend, being selected by the Philadelphia Flyers in the 2017 NHL Draft at the United Center in Chicago. Since then, the trio has shared the ice numerous times as both friend and foe during their time competing against each other in the OHL along with shared Development Camp and Training Camp experiences in Philadelphia. Tonight, the three suit up together for Team OHL as they take on Russia in Game 3 of the 2018 CIBC Canada Russia Series in Sarnia. The first of the three players picked, Frost went 27th overall before becoming an OHL First Team All-Star in the season that followed. He’s currently third in OHL scoring with 33 points (12-21–33) on a Greyhounds team that enters the weekend as the eighth ranked team in the CHL. While Frost keeps busy with a Hounds team that travels some of the furthest distances in the OHL, he always finds time to keep up with the Flyers. 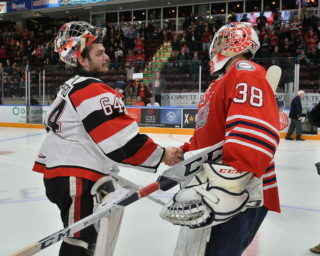 Tonight’s game is a special opportunity for Strome, who was added as an injury replacement when it was announced that Akil Thomas (Niagara IceDogs) wouldn’t be able to compete in either of the two Team OHL matchups. The third of three Strome brothers to come through the league, Matthew followed in the footsteps of older brother Dylan when he won an OHL Championship last spring. He joins Hamilton Bulldogs teammate MacKenzie Entwistle in representing the OHL tonight. The 6-foot-4, 210Ib. winger has 19 points (6-13–19) through 17 games this season. His draft day experience carries with it a memorable tale that includes the whole family. “Before the draft a lot of my family members wrote down on a piece of paper what team they thought was going to take me. After I was picked and we looked at them all, most of them had written the Flyers down. 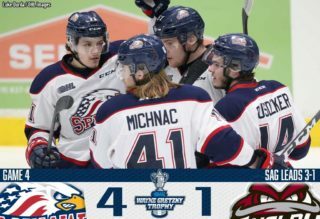 The three Flyers prospects join forces in Sarnia as Team OHL inherits a series tied at three points apiece headed into Game 3. Catch all of tonight’s action on Sportsnet at 7 ET/4 PT as RJ Broadhead and Sam Cosentino provide the call.